History We purchased our 1970 "VW Camper Van" in the summer of 1976 in Indiana. We drove it to California and had it shipped to Clark AFB where we were DoD teachers at Wagner High School. While there we had numerous excursions to Manila, Baguio, Subic Bay, and other destinations on Luzon, the largest Philippine island. In 1981 we took teaching positions in the Marshal Islands where private vehicles are not allowed so we shipped it back to the States and drove it every summer keeping it in storage the rest of the time. In 2007 we retired from teaching after 40 years the last 9 of which were spent in Germany. In the fall of 2007 we took the Camper out of storage in Upstate NY and drove it to Florida where we now live. We have just had a "long block" rebuild done of the engine and I am in the process (Apr. 2019) of getting parts reinstalled and the engine reinstalled in the van. Hopefully that will be done by May. Everything on the exterior is original Sportsmobile woth popup. We plan to paint it soon but keep the original off-white color. 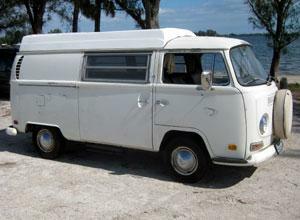 The interior is also original Sportsmobile with electric refrigerator, pump sink, fold-down seat for sleeping. We did replace the headliner and curtains while in the Philippines. The tires are original type German tires as are weels and suspension. The 1600 single port engine is the original and was recently, 2019, rebuilt. Nice. Thanks for keeping vintage iron on the road.